Model #1 - Download it now. LThe new Disney princess arrives from Polynesia and is called Vaiana. 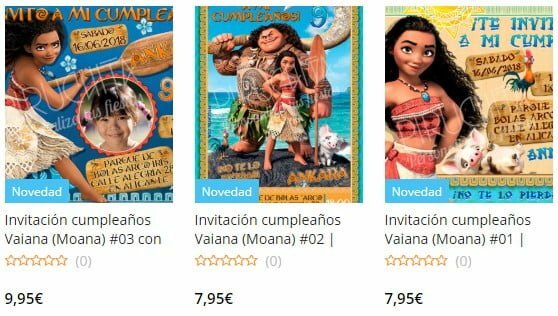 Of course, in Piruchita we advance to its next release the 2 of December in the cinemas of Spain, and we have already designed several Princess Vaiana Birthday Invitations - Moana, so that the kids of the house as they leave the movie theater and ask you to celebrate their birthday party, which can organize the theme for the latest Disney movie. 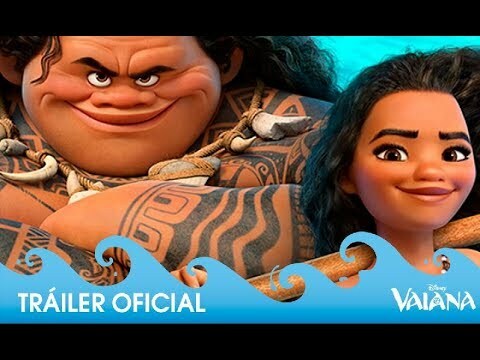 The original name in its English version is Moana, in Hispanoamérica is Moana: Un mar de aventuras and in some countries in Europe (including Spain) we will know it as Vaiana. We get the feeling, that Disney is imitating the concept that has been implemented for years by Studio Ghibli, where the female roles that are used as protagonists in the 70% of their films, are usually characters, each in their own way "heroic ", Represented by princesses, witches and warriors, or even normal girls, which Miyazaki describes as "They are brave, self-sufficient women who do not think twice before fighting for what they believe. They need a friend or a partner, but never a savior ". Disney in his latest films has been presenting us with princesses in the same line, such as Mulán, Tiana, Mérida (Brave) and even Elsa and Anna (Frozen), who are far from the model of princesses who presented us a few generations ago. 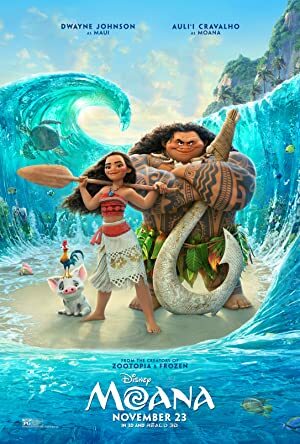 Now Moana, with just 16 years, points to the list of brave princesses, with huge and beautiful eyes (something that also gives the impression that they are more imitating the Japanese anime) and their dexterity avoiding all kinds of difficulties in this new and epic adventure, will fall in love with children and parents. 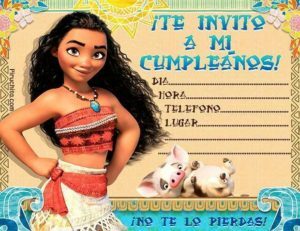 In the three birthday invitation cards we have designed from Vaina / Moana, the main protagonists and their pets appear. 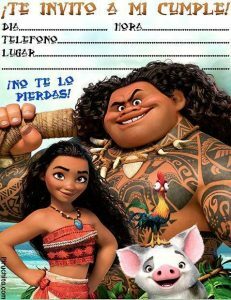 In the first model only Vaiana appears with her cute little pig Pua. And in the 2 and 3 invitations, we've added Maui and the crazy rooster HeiHei. A great adventure about an energetic teenager who embarks on a daring mission to save her people from an ancient and mysterious threat, in a journey of self-discovery. It will be accompanied by the arrogant demi-god Maui, who will guide her on her journey across the ocean in an action-packed journey, plagued by fearsome creatures and impossible challenges to restore lost order. And if you want more details, you can read more information about Vaiana here. 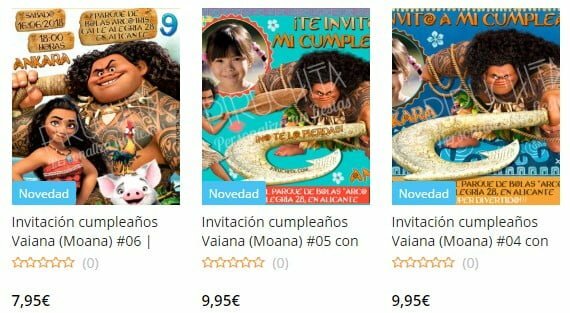 Have you already seen the three Princess Vaiana - Moana birthday invitations that we have prepared for you? At the end of this publication you will find the option to receive them totally FREE to your e-mail but in high quality and resolution format. It is logical that the children of the house want to spend their birthday with one of their favorite characters, Vaina / Moana is the chosen one. 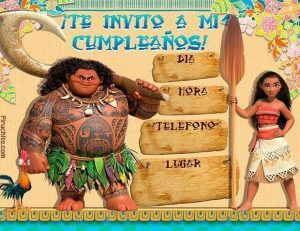 That's why we offer you several personalized premium Birthday Invitations with designs based on this wonderful movie. They can be personalized with photos and texts that we will personalize for you manually with an impeccable result. In just 24 / 48h you will receive them in your e-mail in digital format. Ready to print in high quality or if you prefer, you can use them to send them by whatsapp, share them on social networks, send them by e-mail, etc. Have a great and happy birthday party!